When news that the University of Michigan has received a donation is announced, many people begin to wonder how this incredible act of generosity will benefit them on an individual basis. It is understandable for people to believe that donations do not trickle down far enough to benefit students tangibly. When looking through the comment section of any article about donations, it is clear that a large sum of people wonder why donations are not being used to lower tuition. Take Stephen M. Ross’ recent $200 million donation, for example. The donation will be implemented in the Ross School of Business to create new study spaces, a new career services center, an enhanced recruiting center, a collaborative research facility, new innovative classrooms, and scholarships for business students. On the athletic campus, the money will be used to improve its academic success programs, develop state-of-the-art facilities, and create new spaces for student-athletes to cultivate their success after college (Annarbor.com). Although this all sounds excellent, are there better ways to use these funds? While this is a difficult question to answer, even if we could answer it, it really does not matter. Stephen Ross, and whoever else donates or has previously donated to Michigan, has earned to right to direct their donations in whichever direction they desire. Even if their donations do not trickle down to a point that makes them tangible for individuals, their generosity certainly benefits the University—and the city of Ann Arbor—as a whole. This being said, perhaps these large donations are not as inefficient as they initially appear. Tuition has risen largely because state funding has steadily declined. Over the past decade, state funding has decreased by more than 50% on a per-student basis. In the 60’s, state funding accounted for 80% of the University’s budget. Now, it accounts for less than 17% (vpcomm.umich.edu). Rises in tuition are used to uphold the “core academic missions” of the University (instruction, financial aid, academic advising, museums, libraries, computing centers, etc.). Tuition is not used to pay for athletics, student housing, UHS, student publications, and most construction projects. Donations are a substantial source of funding across all areas. 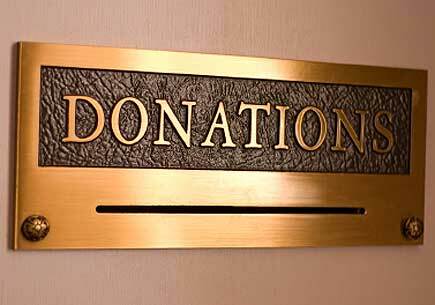 Regardless of what they are used for, donations allow the University to maintain and improve education quality and prestige. In this way, donations aimed at construction projects that may seem superfluous benefit the entire community. Construction creates employment, and once new structures are completed, they create space for jobs of all sorts (doctors, custodians, administrative staff, professors, etc.). New facilities allow the University to build towards the future and establish a competitive edge. So, while it is common to wonder why large donations are not used to directly assist students in a more tangible manner, donations are guided in avenues that tuition itself is not able to reach. Beautiful new buildings and more robust programs create opportunity across the board that improves the University on a grand scale.